It’s been awhile since I’ve posted a fun DIY project, so I thought it was about time! I recently started a new job about 6 months ago at a great company in the suburbs of Chicago. While my commute is a little on the horrible side, I keep myself busy in the car with audio books and even learning French. Oui Oui! One of the great perks of my company is that we have a community garden that I am able to be part of. I have at 5×10 foot plot of land that I’m growing strawberries, cucumber, bush beans, patty pan squash, lavender, and bell peppers on. The only issue is I don’t exactly have a green thumb if you know what I mean. I have a bad habit of killing plants. To my luck, I have had 2 strawberries pop up, but other than that no other crops are growing as of yet. As a new gardener, I thought it would be ideal to have some garden markers in my plot since I don’t know what any of the plants really look like until they start producing some fruit. Bell pepper leaves and bush bean leaves look very, very similar to me – so garden markers to the rescue! Plus, I figured worst case scenario, if my plants weren’t going to grow, at least I’d have a pretty looking garden with my garden markers! 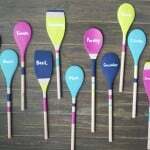 Making these DIY wooden spoon garden markers was a lot of fun and actually pretty cost efficient too! You can find wooden spoons for cheap at local thrift shops, big box stores, or even around your house! Then, all it takes is some acrylic paint in pretty colors, painters tape, a white paint pen, and a few other supplies and you’re all set! Easy peasy. I love the way that the wood shows through in between the paint colors. It gives it a natural, but chic look. I think changing up the colors and line sizes with these is so cute, but you can also make them all the same for a more uniform look if you like. Now let’s get crafting! P.S. If you do make these, please please please send me a picture so I can see! I love to see the creations that my readers come up with! First, tape off a few sections of the spoon with painters tape. The sections that you tape off will remain the natural wood. You will be painting the parts of the spoon that still show. Two to three tape marks should do the trick. Then, apply acrylic paint with the foam brush to the visible sections. Let dry in between coats. You will need two to three coats. Allow to dry completely. Using the white pain pen, write the name of each vegetable or herb on your spoons. Spray with clear acrylic sealer before using outside.